“Being-in-the-moment”, usually refers to the abstract event when an actor feels genuinely connected to their character. “Being-in-the-moment”, usually refers to the abstract event when an actor feels genuinely connected to their character. It is a brief jolt of inspiration and concentration, when the actor truly believes in the realness of the character’s given circumstances, objectives and actions. 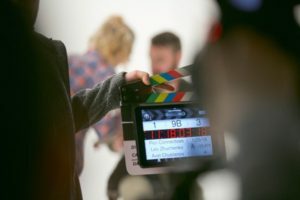 “Being-in-the-moment” for an actor can be quite illusive, especially when performing a character that the actor doesn’t naturally connect with. It becomes especially difficult for the actor who must perform the same lines over and over again, such as a stage actor who must perform night-after-night or a film actor who must do many takes of the same dialogue. However, there are many preparatory techniques an actor can take to achieve the all-important and very illusive feeling of “being-in-the-moment”. These steps can include things like relaxation, imagination, concentration and the “magic if”.